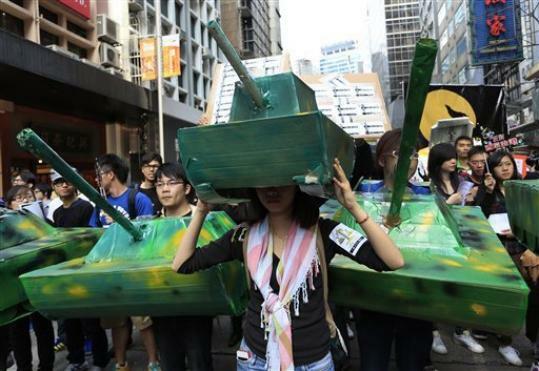 In a march themed with fanciful allusions to Little Red Riding Hood, thousands of protesters swarmed Hong Kong’s streets on Sunday in the first large display of protest since the city’s elite tapped a Beijing ally to become the Chinese territory’s next leader. In the Dakotas, members of the proud Lakota Nation began a 48-hour hunger strike on Sunday in opposition to the Keystone XL pipeline — and all tar sands pipelines — they say will destroy precious water resources and ancestral lands in the U.S and in Canada. Jordanian authorities arrested more than two dozen political activists during protests Saturday critical of King Abdullah II that called for a change of government. An estimated 800,000 homeowners in Ireland joined a tax boycott by refusing to pay a new flat-rate $133 property tax by Saturday’s deadline. On Saturday, nearly 100 people wore hoodies in Bethlehem, Pennsylvania to protest the killing of Trayvon Martin. Thousands of Palestinians protested on Friday against Israeli policies of land seizure and control of Jerusalem, leading to clashes with Israeli troops in which a 20-year-old was killed and scores of others were injured. Three protesters were arrested Thursday at the UC Board of Regents meeting, when a few dozen activists, some stripped down to swimsuits, called for more transparency in state funding talks and an end to tuition hikes. On Thursday, hundreds of Bahrainis staged a sit-in outside the offices of the United Nations in Manama demanding action over the “excessive” use by police of tear gas against protesters. Some 50 students at the all-boys Frederick Douglass Academy in Detroit were suspended Thursday after walking out of classes in protest of absent teachers, inconsistent classroom instruction and other issues.